It’s been a long time since Fikri Jermadi watched a film blind…so to speak. From one clichéd adventure to the next: no sooner after I had reviewed ‘The Judge’ than a film came along with such grand sweetness that it’s difficult not to fondle around in the dark for an Equalizer (or three). 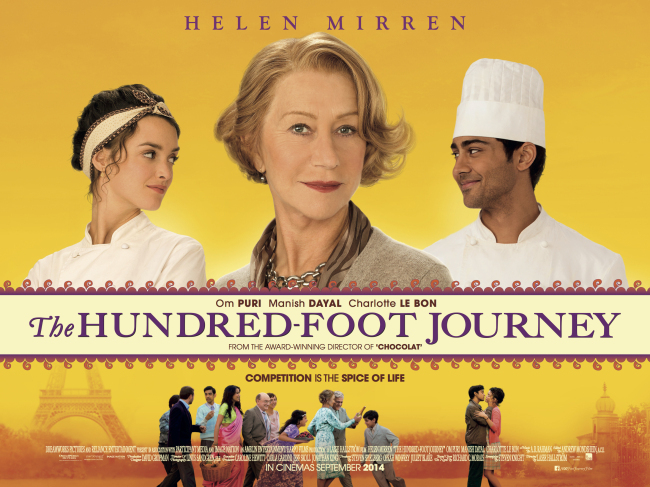 That was what ‘The Hundred Foot Journey’ was like in many respects, and not only because it featured a lot of sumptuous shots of foods being prepared and consumed in a delightful manner. 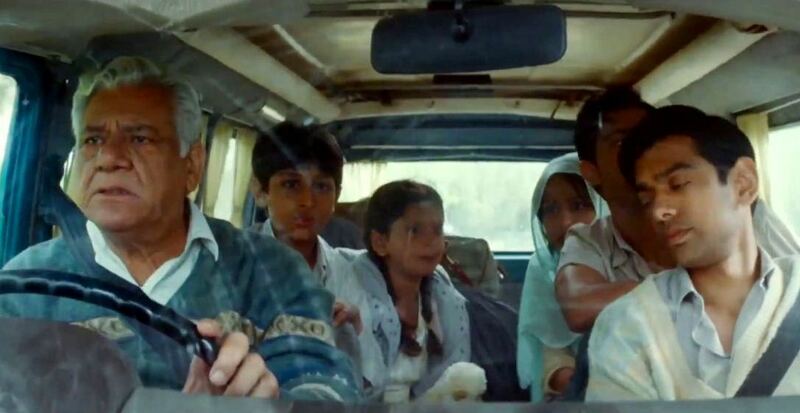 We follow the story of the Kadam family, lead by the patriarch Papa (Om Puri). A brief montage-like sequence at the beginning established their issues: they run a successful family restaurant, but troubles back home in Mumbai (which involved the demise of the matriarch [Juhi Chawla]) meant that they had to relocate to London. Here, Papa, along with the rest of the family, decides to move on to pursue their culinary dreams. A failed brake in a quaint French village meant the family was somewhat stranded there. However, Hassan (Manish Dayal), the star pupil of the family, if you like, met Marguerite (Charlotte Le Bon), who helped the family back on their feet. Papa evidently liked the place enough, so much so that he plonked down a somewhat unbelievable amount of money to purchase a run down building. The plan? To open an Indian restaurant. That seems alright enough, but the only issue is that across that literal road lies an upscale Michelin Star restaurant owned by Madame Mallory (Helen Mirren). It is literally a hundred foot away, hence the title, so you have an idea of the proximity within which such different clashes (partly of a cultural kind, and also an economic one) would take place. Adding intrigue to this is Marguerite, who also works as the sous chef at said restaurant. How, then, will the family face this? Will they thrive in the face of such heated competition? Will Papa prevail against the not so malleable Mallory? Can Hassan’s affections for Marguerite grow in the context of their professional rivalry? I raise those questions in a rhetorical manner, of course, because this film plays out exactly like the three-course dinner you would expect. Perhaps I should stop here and apologise for the use of culinary terms peppered throughout this review, but hopefully it will help to colour the picture just that bit more vividly. Throughout the whole film, as I watched it, I was just pleased at how pleasant the whole experience was. Nothing new to truly shock the sense, but a cliché-ridden film that made me smile is never a bad thing, is it? Once the credits rolled up, though, and the director’s name was revealed, I smacked my forehead: Lasse Hallstrom! Of course! I had gone into this film blind, but had emerged with my sense awakened. He’d like to get sous-neath her (Buffay 2000s). For no one but no one does sickly sweet films like this director. In fact, there were parts that made me feel everything went a little too smoothly The initially bravado amongst the warring restaurateurs eventually subsided into a quiet entente cordial (perhaps I should also apologise for the French terms) that grew into mutual admiration and…something else. No surprises here, but the pleasantries does make me feel like more conflict would have spiced things up. For example, it was clear from the beginning of Hassan’s affections for Marguerite. That’s fair, for Charlotte does have a very charming and special quality about her. However, it only takes a few turns for the road to straighten out for the both of them; the piecemeal attempt at creating a conflict between the two was not all that successful at making me hang on the edge of my seat. Again, an exaggeration, but you know what I mean, and you can see how they would end up together. Perhaps the closest this movie came to truly making me wonder “What happens next?” is somewhere near the middle, when rogue elements from Madame Mallory’s kitchen decided to desecrate Maison Mumbai (the Kadams’ restaurant) with some inflammatory messages on their walls. However, Mallory herself was not best pleased, and even made the effort to rub the writings of the walls herself. This was a turning point for both Papa and Mallory, but it mimics the relatively untroubled path taken by both Hassan and Marguerite. Helen Mirren: French-speaking English-Russian performer. Impressive. Another issue that jumped out at me is just how much money the Kadams actually have. I know, this is a film, and there should be a strong detachment from any real attempt at matching it with a sense of verisimilitude. Nevertheless, the whim with which Papa bought the derelict building was surprising; the family had been portrayed as having to struggle to even sort out the brakes for their death trap of a van, yet here he is, plonking down the payment without as much as batting his eyelids. The same goes for the spices, too. They were hand-me-downs from their restaurant in the real Mumbai, the secrets of their mother’s recipe, yet that amount packed in the suitcase was enough to service their customers on a nightly basis with no real signs of diminishing returns. It raised my own eyebrows, if not Papa’s. Nevertheless, that does not take anything away from this film. The fact is, a walk down the side of La Seine in spring might strike you as equally clichéd, but as I argued in the review of ‘The Judge’, it does not necessarily make it any less effective. A bit more of the conflict (and the subsequent payoff) would have made me wonder a bit more, but it does not really detract from the wonderful beauty of this film, the food and the assuredness of Helen Mirren and Charlotte Le Bon’s charm. If you were walking down that river in Paris, my friend, you would not be complaining, would you? Don’t push Fikri into that river, though, for then people would say he’s in Seine. #thekol This film was nominated in the Lead Actress in a Motion Picture – Comedy category at the 72nd Golden Globes Awards.